Access the mobile version of MSL/URSUS catalog and other features anywhere using any Web-enabled mobile phone or device! You now can access our library catalog, MSL/URSUS, using your mobile phone via LibraryAnywhere app or web link! Search, discover, and interact with our library - anywhere you are, right away! The mobile website is located at https://www.libanywhere.com/m/613. Library Anywhere is a universal mobile web version of our MSL library catalog that works on any smartphone including a Blackberry. To view and use, visit https://www.libanywhere.com/m/613 or visit MSL home and click on the mobile link at the bottom any of our web pages. In addition, iPhone and Android phone users can download a native app (in this case, an application that can be downloaded from the App store and lives on your smartphone). This app for Library Anywhere offers a few extra features, including the ability to scan the barcode of any book, anywhere, and immediately check if it is available in URSUS libraries - and then request it! View the MSL/URSUS Mobile Guide and/or contact us if you need help. 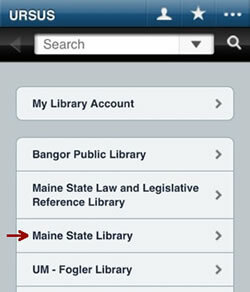 Once you click the Library Anywhere app on your smartphone, choose Maine State Library. Check out the guide for the mobile MSL/URSUS catalog and website [pdf, 92 KB] [Word version, 640 KB] and see an example of a full MSL/URSUS record with information about the some of the features. 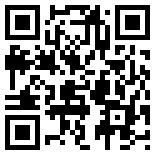 The QR code above will take you to the library's mobile site. Try it!! 1. Visit Google Play (formerly Android Marketplace) on your phone and search for 'LibAnywhere'.